It’s great to see that Dr. Renwick does not agree that global warming had anything to do with this summer’s weather in the antipodes. One wonders what exactly Dr. Renwick might claim as an indicator in New Zealand of global warming. I think any speculation on what James Renwick meant is moot in this case. Definitely incumbent on the National news and current events broadcaster to convey the facts but in this case they’ve failed. I have to say though, being familiar with Renwick’s climate double-speak since he’s assumed Jim Salinger’s mantle, that I completely understand how Renwick was misinterpreted by them and by Corin Dann in particular. If you are making a news item on the basis of your personal but incorrect premise, you are not reporting facts. And if you are intent on presenting that premise during an interview with an “expert” to the extent that it prevents you from determining exactly what the expert is saying, then why did you need the expert at all except as a sounding board for yourself if all you are doing is imposing your own opinion on a topic rather than seeking expert-based assessment? A caution: some “experts” are looking for every opportunity for public exposure of their particular slant on an issue and wont voluntarily correct your false assessment of it if it suits their purposes to have the public left with the false impression you’ve created. James Renwick is one of those. Also Corin, be especially cautious of an expert whose narrative includes “Yeah, it is. Yeah, climate change, global warming” and “That’s the bottom line, yeah”. I would agree that the dialogue on both sides was largely gibberish. What happened to our language? Yes, it’s moot. But it’s useful to have his firm statement on record that weather events are not caused by global warming. Everyone and his dog has been looking around at this warm record or that storm and saying that’s global warming, we’re all doomed. It will be handy to slap them with Renwick’s authoritative statement. Do you mean “there’s no global warming, so it doesn’t cause weather events”? James makes it crystal clear that he did not say, and it’s not true, that global warming caused the drought. Unless he’s being most audaciously devious, which I cannot believe. I’ll likely (95% confidence) release the email in due course. BTW re sweetness, it is amazing to watch the Asians: mostly Malays, Chinese, some Japanese, Korean, Vietnamese and Phillipino (but most of our overseas workers are Vanuatuans – sweet-tooths too), ladling half a dozen spoonfuls of sugar into their teacups. Cherries were extra sweet this year, a good size, no splitting due to little rain and lots of sun. The crop was knocked back about 30% by very late frosts (7th Nov) which meant the remaining fruit was larger than normal. Plus, we irrigate them with trickle irrigation so dry conditions are not as much of a problem. I did note that the water table remained well above normal summer levels and our irrigation well supplied full irrigation throughout the season. From my experience, this summer in North Canterbury was not exceptionally dry by any stretch. We did not have nearly the number or strength of Norwesters which are the really drying winds. We did have plenty of sun though. In fact, I was ordered to install a small swimming pool, which is now dismantled for the winter. Good result Mike, and up 10% on last season (if I’ve got that right). Last year the last frost was on 3rd November. It was a very light one. Last year’s crop was about 60% of normal. Then we got the rain at Christmas which buggered everything! I would have lost money on my frost bet. I recall too discussing frost mitigation a year ago. Does the larger fruit offset (to a degree) the cost and effort of frost protection (just going on Nov 2012)? Fish and other sea life have been moving toward Earth’s poles in search of cooler waters, part of a worldwide, decades-long migration documented for the first time by a study released Wednesday. The research, published in the journal Nature, provides more evidence of a rapidly warming planet and has broad repercussions for fish harvests around the globe. University of British Columbia researchers found that significant numbers of 968 species of fish and invertebrates they examined moved to escape the warming waters of their original habitats.Previous studies had documented the same phenomenon in specific parts of the world’s oceans. But the new study is the first to assess the migration worldwide and to look back as far as 1970, according to its authors. The conclusions have important implications for fisheries and the people who depend on them. In developed nations, the fish migration poses costly challenges for the commercial fishing industry. In less-developed nations and the tropics, the movements could threaten a critical source of food. Remind me again how migratory behavior of fish in Canada relate to the issue of TVNZ and their coverage of the north island drought? I am sure there is a connection somewhere …. Indeed, Andy, the connection is a phenomenon known as Anthropogenic Global Warming – perhaps you may have heard of it? realityrulesok (Rob Taylor) has demonstrated for the last time a deep contempt for courteous behaviour and he has gone off somewhere. I don’t know where and I don’t care. He will not be returning. Man you guys are stubborn. What don’t you understand about the effect that the GW trend has on the shifting of probabilities for weather events such as droughts or floods? Don’t you think you look silly riding this ‘Causation’ debate about ONE drought when really you should think about the outcome if we have a rise in the frequency and severity of these droughts to consider? If you are a smoker and get lung cancer, does this prove that YOUR cancer was definitively caused by smoking? No. If however the lung cancer rate among 1 million heavy smokers is ten times the national average, would you resist to concur that smoking caused the vast majority of the extra cases? People rebuild their houses after one flood and the insurance generally pays. But if the frequency of flooding goes up, eventually affected areas will have to be abandoned as no bank and no insurance man will want to pay for the folly of building there. Even our current government (Bill English) admitted that he (the government) will not be able to offer prolonged assistance to farmers in the case of a rising frequency of droughts and told the farmers that they will have to change their practices to adapt. I agree. You seem to want to wring some confirmation of your denial of the contribution of GW to drought out of talk about one specific drought. But this is misleading and on a statistical basis with a broader view than one summer, it will prove to be plain wrong. The forecasts of increasing extremes in a warmer world have been made for a long time now and they are pretty uniformly held and confirmed by the science community. The case of the moderation of weather patterns – especially the oscillation behavior of the northern hemisphere jetstream due to the warming and ice reduction in the Arctic is particularly well documented. The current wicket May weather in the US Midwest is a good recent example. The wickedness of the weather of late can with good support from leading scientists be attributed to our warming planet. No Andy. You guys look desperate to try to mislead the public into thinking that global warming is not causing droughts (or floods) for that matter. Its you guys here that are trying to spin this story so that perhaps some folks out there think: Oh well, its juts weather. Its nothing to do with climate change. That, would be a bad outcome and would be the propagation of a lie. You know that. Now back of the case and get real. Tell the public that they can expect more droughts and tell the farmers that they will need to adapt to the changing climate as there will be no tax payer bailouts trying to pay for unsustainable farming practices in changing climate. Bill English said so much himself. For warming to influence weather, it must first exist. Do you agree? No warming, no influence. Show us warming over the last approx. 17 years! If the ocean’s warming without warming the atmosphere, how has that been affecting the weather? It’s pretty obvious RT. You can not conclusively say that a weather event was caused by AGW. You can however say that the probability of such an event occurring has increased/decreased because of AGW. TVNZ produce a piece that directly contracts the email statement of James Renwick, we point that out and are accused by you, Thomas, of propagating a lie. This is true. Renwick says that a one in 50 year event might become a one in 25 year event, so if we check back in 100 years we might have 4 data points, or maybe 2. No argument with that. What are you on about? In the UK, the met office predicted drier summers and wet warm winters. The exact opposite has happened over the last few years, but hey who cares, it’s all climate change. Richard, the AGW forcing has gone on unabated. The rise of atmospheric temperatures will be undulating, due to well researched ocean circulation patterns, solar rhythms and so on. If you subtract the natural cyclical signal from the data, the steady rise of the trend is clear as a bell. Here is a video showing you the temp record plus especially the last 16 years with subtracting the known natural variations from the data. And again, this is just the air temp record. Remember that the vast majority of the heat content added to the Earth system is stored in the enormous heat capacity of the oceans. Yes Andy. Spin makes a lie out of situations. I repeat: You are riding this because you hope that some passer-by spectators here might think that the last drought (and perhaps by inference droughts or weather extremes in general) have nothing to do with AGW. I am I not correct? This is the fallacious story you are trying to spin. This drought, its duration and severity has been made more likely due to AGW. This is a fact that is well supported by science. And this is the message that people need to hear. The rest is semantical shenanigans on your end and utterly irrelevant to the message and the management decisions that Farmers and others that will be effected by the changes in climate will have to take into account. So you accuse the scientists who reported on species migrations of fraud? Do you think they made their data up? Have you got any alternate data at hand showing that species have been staying put and habitats have not changed? Or are you again and again confusing natural variability of the climate data, i.e. short term fluctuations, as an indicator to trend changes? The story that you are trying to spin is that it is perfectly fine for a public funded broadcaster to make stuff up. This discussion is silly. Trolls such as Thomas and his fellow members of the Flat Earth Society, are clearly in need of a return to Primary School, and a massive re-education kick start. Andy, Rich C and Richard T – your tolerance is extraordinary. Out of date data. Since the end of series 2010 El Nino, temperature anomalies are way back down near all dataset baselines i.e. nowhere near the trajectory of say Foster and Rahmstorf’s data torture exercise. Latest April UAH anomaly is +0.1 C in ENSO-neutral conditions. At the beginning of 2010 (El Nino) it was up around +0.58 C anomaly and made Foster and Rahmstorf look good. Now they look silly. Yes, at least for the last decade it has stopped completely. For up to 23 years (RSS) warming is statistically insignificant and not the 0.2 C/decade required of AGW. They found that fish have moved. They assumed that the fish moved because of global warming. Two different things. 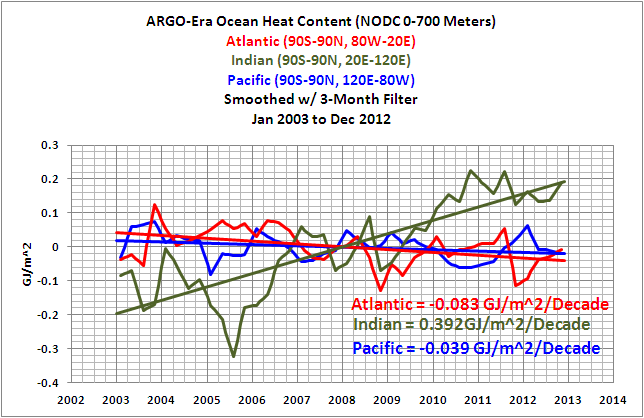 As many have pointed out, the oceans haven’t warmed significantly for about 19 years. So if the fish are moving, could it be due to other factors? Changes in circulation patterns? Over-fishing in the tropics? These are valid questions to ask, in an era when absolutely everything is blamed on global warming. And even when all the dust has settled, global warming doesn’t necessarily imply anthropogenic global warming, does it? The Medieval Warm Period was warmer than the present, and the Roman Warm Period was warmer again. Before that the Minoan Warm Period was still warmer. All these Warm Periods occurred naturally, so until irrefutable proof is presented (it hasn’t yet) we must assume the null hypothesis and conclude that the current warming is natural too. And the “science” as applicable to “This drought” is (citation please)? Or are you just making it up as you go along? FYI, there’s a standstill in the NZ temperature series too (NIWA or NZCSET – take your pick but there’s no difference in the recent years). If NZ temperatures have remained static this century, albeit warm, why wasn’t there a drought of comparable “duration and severity” to “this drought” every year this century? Interesting video, thanks. I was surprised to see so much warming over the last 16 years, so I looked at a few things. The GISTEMP LOTI dataset from 2001 to the present shows stasis and from 2002 considerable cooling. That’s 11.5 years of the 16 years that Cook is illustrating. Even the dTs dataset shows stasis from 2005, which means 7.5 years of warming gone. To verify this, go to Wood for Trees and use the interactive graph. Kindly explain why he shows warming that occurs over just 4 to 8 years as if spread over 16 years. It doesn’t make sense. The presentation is hard to believe. I noticed the paper when it was published earlier this year and wondered at their ability to identify the forcings, given our poor understanding of the climate system — the IPCC can’t. In addition, there has been no warming for the last 16 years if the temperature has not been rising, no matter how many forcings you “remove.” To show it rising at the same rate since 1978 is simply ridiculous. We haven’t even begun to consider the hugely controversial “removal” of the natural forcings. We just don’t know enough about the climate system to do that. I don’t think anybody else has tried it. I note that he doesn’t show us the size of the human forcing, yet his slick commentary strongly implies that their mathematics isolated it. I remain unconvinced; your evidence has to be stronger. One more thing: you mention “the vast majority of the heat content added to the Earth system is stored in the enormous heat capacity of the oceans.” Yes, that’s true. But your implication, that somehow the climate is influenced by telemetry from deep in the ocean without the air temperature rising, is nuts. I don’t accept that heat “stored” in the oceans has any climate forcing capacity until and unless it emerges to heat the air. Reasonable? Thomas – even if the fish are migrating due to warming temperatures, you have absolutely no evidence whatsoever that this warming is anthropogenic in origin. In order to claim that something is causing an effect, be it fish migrating, ice melting, etc, you must first establish that the ‘something’ exists. CO2 can only raise the temp 1.2C maximum per doubling of total (not just man’s) atmospheric CO2 levels. Positive feedbacks are supposed to triple this initial warming effect, and the vast majority of these feedbacks is supposed to come from water vapour. The positive feedback from water vapour was supposed to be evident in a tropospheric hot spot that has not eventuated in over 40 yrs of looking from more than 30,000,000 weather balloons and 2 satellites. Now, without the tropospheric hot spot what evidence do you have of positive feedback from water vapour? Without evidence of positive feedback from water vapour what evidence do you have of of AGW beyond the tiny 1.2C per doubling of CO2? Without evidence of AGW beyond a tiny 1.2C per doubling of total atmospheric CO2 levels, what evidence is there that the fish migrations, melting ice, or any other evidence of warming is attributable to man’s CO2 output? If you want to blame warming on a cause then you must first establish that the cause exists. Without the tropospheric hot spot to prove positive feedback from water vapour you don’t have this evidence except for a trivial amount of warming attributable to CO2 alone. And before you go running over to skeptical science in search of the tropospheric hot spot, all the papers Cook puts up on SKS have been debunked (funny he doesn’t mention the papers debunking them). In addition, the temperature records reflect approximately what would be expected without feedback from water vapour, which is why the climate models have all failed so dismally. The level of CO2 was 398.35ppm in April, 2013, up 1.9 from 396.45ppm in April 2012. At the current rate of 1.9ppm a year it will take 210 years to double the CO2 levels to 796.7ppm giving us a maximum temperature rise of 1.2C. For it to rise an additional 1.2C it will need to double again to 1593.4ppm which at our current rate of 1.9ppm will take another 419 yrs. Please remember that the 1.2C attributable to a doubling of CO2 is the top end is well, it could well less and due to the fact 1.2C is an extreme it probably is. To get anywhere near the predicted levels of around 3C predicted by the catastrophists, it is going to take 629 yrs, end even then it’s only 2.4C. To prove otherwise you need to prove positive feedback from water vapour, and to do that you’ll need the tropospheric hot spot – which doesn’t exist. All this talk of migrating fish is irrelevant waffle without first establishing the cause of the warming, and the empirical data shows that it’s not man except for a tiny amount. Evidence of warming is not evidence of why it’s warming – where’s your evidence that man is responsible? Now even the upper Indian hasn’t warmed since 4Q2010. But of cause it is affecting things at the surface and it will emerge and affect the surface! Heat stored in the ocean system is accumulative. The only way to cool the oceans again would be, guess how? Through giving off heat to the atmosphere! The atmospheric temperatures are greatly influenced by ocean temperatures. And deep ocean water will eventually well up again on the upward parts of the great ocean circulation currents. Energy as you know, is a conserved quantity and just because the oceans store the vast majority of the energy excess due to AGW, does not mean we will not see the effects. Why don’t we discuss theories of ocean warming on its own thread? It doesn’t see relevant to the topic of the post. The top layers of the ocean are expected to store the energy, not the bottom. But the top layers aren’t warming. Please provide us with the links to the relevant portions of the IPCC reports that predict that the deep ocean will warm while the atmosphere and upper layers do not. Merit in that I agree Andy, except that ocean heat is now the underlying thread of all of this like it or not. Even the most significant element of your Lewis CS comment in ‘Global Warming’ is ocean heat. OHC is front-and-centre now the atmosphere is a non-issue, every climate issue, including NZ drought and the porkies derived from it have an ocean heat element to them one way or another. I think the problem will be resolved once RT takes the ocean heat issue to post level and keeps it fresh as Jo Nova does (see Flipper’s quote). I know by email that RT is considering this on Tuesday. And yes there’s the ‘Ocean Heat Content’ ‘Open Threads’ but I’m about the only one that frequents them. The issue however is continually topical now and the likes of SkS have been banging on about it with their own spin at post level for some to now so ocean heat specific comments can be contained rather than spilling over into off-topic threads. It would be good though to use the ‘Open Threads’ more for discussion but posts are what provoke it eventually in comments unfortunately. RT will be forced to take the initiative soon and I sense he will as he gets to grips with the details of it (there’s a lot of it to digest) as I see in some recent comments of his (also by personal communication). In doing so much of the OHC knowledge gap (e.g. Thomas’) will be bridged too so hopefully some of the ignorance will subside. Actually no. The ocean WAS giving off heat CONTINUALLY but NOT cooling up to the early 2000s, it was accumulating heat as you yourself state Thomas but gains were greater than losses. The only way to cool the oceans is to reduce the energy input so that losses are greater than gains. That occurred from about 1986 and the thermal lag took effect by early 2000s after which the upper Pacific and Atlantic have been cooling (Indian was still warming because it receives heat mainly from the Pacific by circulation and from the Atlantic to a much lessor degree, but the upper Indian stopped warming 4Q2010). But the reduced energy input to the the ocean since 1986 has been a minimal reduction and therefore minimal OHC reduction, it is only since 2011/12 that the input reduction is becoming significant. The effect (of any significance) of the post 2011/12 energy input reduction wont show up in the atmosphere until about 6 years have elapsed (Trenberth). The accumulated energy is solar-sourced (not “due to AGW”). The accumulation will be released progressively as it always has been. It will not be released in one dollop so that we all swelter. And because losses will be greater than gains due to reduced energy input, the accumulation will turn to a de-accumulation (for want of a better term). That process is already underway starting back in the early 2000s.